Over 500 car wash operators, experts, and manufacturers met in Columbia, PA November 13-14 for the Kleen-Rite Learn More, Earn More Expo and Car Wash Experience. This biennial expo is a great opportunity for training and networking. The event started with a tour of three southern Pennsylvania car washes. Participants had the chance to check out equipment rooms, self serve bays, and automatic washes as well as a tunnel under construction. The group also saw state-of-the-art bay lighting, self-serve dog washes, and unlimited wash systems. A networking lunch followed the tour, after which attendees heard from a variety of speakers. Author and consultant Mike Greene spoke about providing “Gold Star Service," while Kleen-Rite vice president Keith Lutz discussed the positive future of self serve car washing, reporting that 80 percent of washes saw consistent or increased growth in the last year. The day concluded with a panel discussion and open Q&A session. One unique feature of the Kleen-Rite expo is the cost: it’s free! On November 14, the main expo hall opened to all. Prospective, new, and longtime car wash operators alike attended to benefit their business and make new connections. Over 60 companies exhibited, covering all areas of the industry, including dog washing and motorcycle washing. Off of the main expo floor, seminars kept patrons engaged, many afforded standing room only. A complimentary lunch provided more networking time before jumping back into training and a door prize raffle. 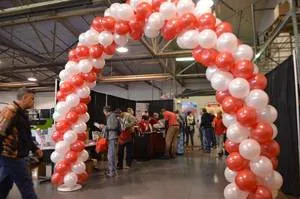 Held at company headquarters, the expo is completely staffed by Kleen-Rite employees who head out of the office or warehouse and get to meet their customers. Many agree that face-to-face interaction is one of the best parts of the Learn More, Earn More expo. The next Kleen-Rite Expo will take place in 2020. For the latest information, visit www.kleenrite.com. Kleen-Rite’s corporate colors welcome attendees to the expo.